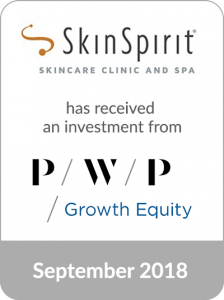 SkinSpirit Skincare Clinic and Spa (“SkinSpirit”), one of the Nation’s top destinations for medical aesthetic skin and body care with locations in California and Washington, has received an investment from PWP Growth Equity, the middle market private equity group of Perella Weinberg Partners. Cascadia Capital, an investment bank serving middle market clients globally, arranged and structured the financing and acted as the exclusive financial advisor to SkinSpirit in the transaction. Strong consumer demand for medical aesthetic skin and body services is driving significant industry expansion and SkinSpirit, a first-mover in the space that has delivered positive results to clients since 2003, is a leading branded service provider in the segment. The investment from PWP Growth Equity will be used to accelerate SkinSpirit’s expansion in new and existing markets. “We are very excited about our partnership with PWP Growth Equity. They bring many key attributes that will help us achieve our strategic growth plan. Their experience scaling multi-unit service-based businesses will enable us to take full advantage of an accessible and sustainable market opportunity,” commented Lynn Heublein, Co-Founder and CEO of SkinSpirit. The investment by PWP Growth Equity in SkinSpirit represents another successful transaction in experiential retailing and restaurants by the Cascadia Consumer team.